Update: Sold out, but a few RESALES AVAILABLE. Ready to move in. Please enquire for latest availability and prices. These designer apartments and penthouses under construction are built over 3 phases. Phase 1, covers over 10.500m2 which leaves an amazing outside space for stunning sustainable gardens, salt pool and a new concept of outdoor sports area, with private running track and health areas. The size of the land of over 9 hectares, the low-density buildings and the carefully studied design of the blocks, have made possible to build a new concept of urbanization, surrounded by nature, adapted to a modern lifestyle but conserving the charm of Andalucía. 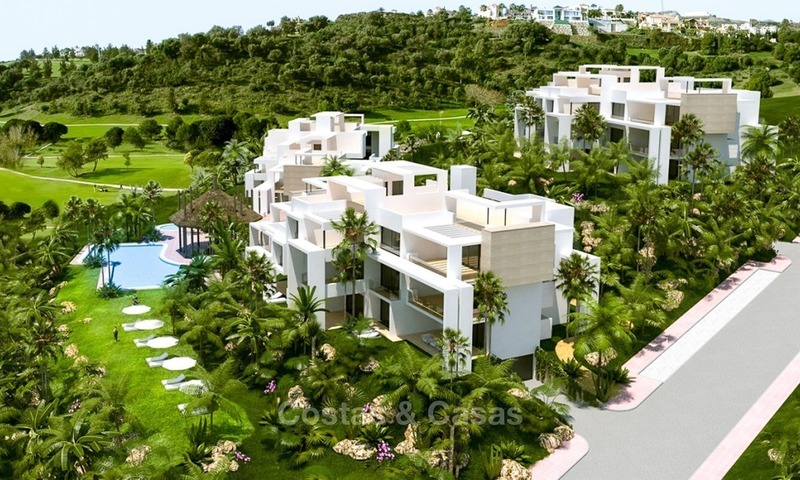 Surrounded by nature and just steps from all sort of amenities, services, restaurants, beaches, golf courses, schools, etc… It is an idyllic place to breathe pure air and tranquillity while enjoying the countryside charm without renouncing to the luxury and services offered by the Costa del Sol. Spacious 2 & 3 bedroom apartments built to the highest standards varying in sizes. 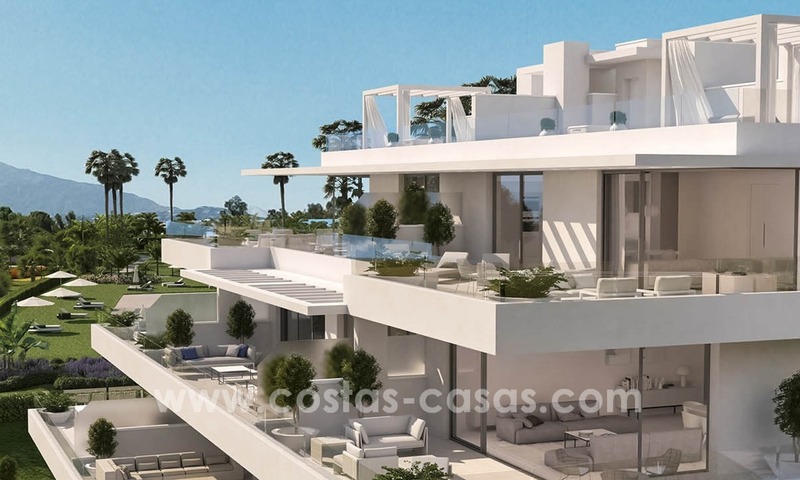 Ground floor apartments with large private gardens that will be maintained by the community, to large duplex penthouses with private roof top solariums and Jacuzzis. All the apartments will be completed to the same high standards and the majority of the properties will have a partial sea view orientated mainly to the West. Tile flooring throughout and designer bathrooms and kitchens with all modern amenities including under floor heating throughout, hot and cold air conditioning, full pre installation for state of the art domotic systems. Every room has a view with spacious terraces overlooking the tropical landscaped gardens with private and very spacious pool area. Luxurious complex of over 9 hectares of subtropical vegetation, outdoor and indoor pools. Low density building. - 70% of the apartments in Phase 3 are already sold in 1 month. Exceptional opportunity! We have 3 ready to move in apartments from an investor in resale. We are therefore very pleased that we can offer these to our clients in the most requested complex in Marbella and surroundings. The living room and the 3 bedrooms all give out on the terrace and garden which gives a feeling to live in a villa. Corner apartment 1: Built: 114m2 plus 78m2 terrace and 136m2 garden: € 545,000 ex. Purchase costs. Corner apartment 2: Built: 114m2 plus 78m2 terrace and 152m2 garden: € 545,000 ex. Purchase costs. 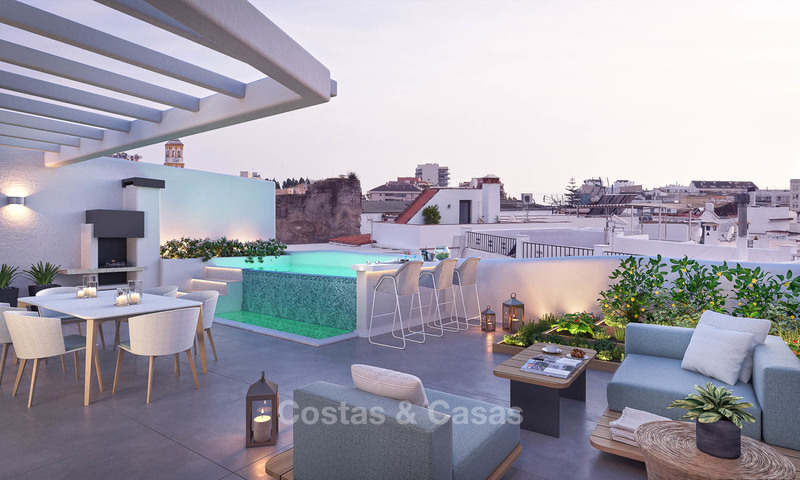 Corner penthouse: Built: 134m2 plus 80m2 terrace plus 66m2 roof terrace: € 760,000 ex. Purchase costs. Update 2019: The promotor has Sold out. We do have resales available. Please enquire for availability and price.